We’d love your help. 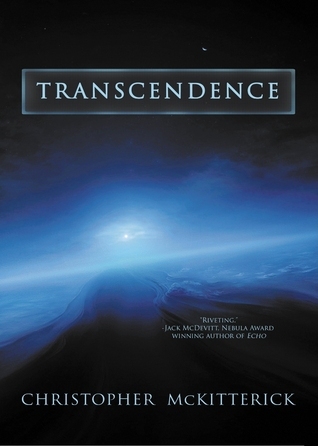 Let us know what’s wrong with this preview of Transcendence by Christopher McKitterick. Humankind rushes toward self-destruction, and must evolve or die. Our perspective: a scientist exploring an alien artifact on Triton, a teen-aged hacker in a city gone mad, three actors manipulated into igniting interplanetary war, the de-facto ruler of half the solar system, a soldier fighting in Africa to entertain his audience, and an artificial intelligence facing pers Humankind rushes toward self-destruction, and must evolve or die. Our perspective: a scientist exploring an alien artifact on Triton, a teen-aged hacker in a city gone mad, three actors manipulated into igniting interplanetary war, the de-facto ruler of half the solar system, a soldier fighting in Africa to entertain his audience, and an artificial intelligence facing personal crisis. In the not-too-distant future, humanity has colonized the solar system. People present themselves virtually, sometimes several layers deep, and it's often hard to tell who is real. Battles raging in trans-Neptunian space and on Earth are broadcast for the entertainment of millions. The audience is unaware if the characters are intheflesh or virtual. An orbiting EarthCo-owned supercomputer called the Brain becomes sentient while the tycoon who created it spins plans to take over the solar system. A lone scientist explores an alien artifact on Neptune's moon Triton, aware that squabbles between rival corporations not only interfere with the broadcast battle, but threaten to destroy him, the artifact, and potentially all of humankind. To ask other readers questions about Transcendence, please sign up. Chris McKitterick's TRANSCENDENCE pushes the limits of imagination, taking the reader across the solar system while remaining firmly grounded in the human experience. The breadth of the story is impressive. We follow the interwoven lives of many characters, some on earth, others on far-flung planets, still others trapped in virtual worlds; all tied together by a singular moment in history when humanity will have the opportunity rise above the misery of a semi-artificial universe of its own makin Chris McKitterick's TRANSCENDENCE pushes the limits of imagination, taking the reader across the solar system while remaining firmly grounded in the human experience. The breadth of the story is impressive. We follow the interwoven lives of many characters, some on earth, others on far-flung planets, still others trapped in virtual worlds; all tied together by a singular moment in history when humanity will have the opportunity rise above the misery of a semi-artificial universe of its own making, and at last understand the meaning of friendship. The first couple chapters were a little bumpy for me, but once I got used to the state-of-the-art computer technology and the virtual realities that characterize this world, there was no putting the book down. The characters are vivid, brutal, and most importantly alone in their collective journey toward destruction. McKitterick is an artist in his use of tense and person as he moves from character to character. For the most part, the book is written in third person past tense, but there is one character who always appears in present tense. And another evil psychotic whose every chapter is in second person, which makes YOU the evil psycho of the story (except not really, because evil psycho keeps referring to events in his personal history of which the reader has no knowledge, which makes the reader feel even more disoriented and psychotic...it's quite a trip, let me tell you...) And then, there's a super AI computer on the verge of consciousness, whose scenes flip from one sentence to the other between first, second and third person. All in all, it's a wonderful ride. Oh, and there is this great, subtle dark humor laced throughout that makes you smile in unexpected moments. This is a strange little book. The prose is not quite up to it's ambitious reach, yet there were a number of really beautiful emotional moments that made me cry. There were also a number of cringe moments when it was just sentimental. It's certainly not hard SF - at times it falls into the mystical - although a character tell us we shouldn't be taking religion into this sacred space. It might have been a bit too complicated for its own good - too many characters that didn't really add anything t This is a strange little book. The prose is not quite up to it's ambitious reach, yet there were a number of really beautiful emotional moments that made me cry. There were also a number of cringe moments when it was just sentimental. It's certainly not hard SF - at times it falls into the mystical - although a character tell us we shouldn't be taking religion into this sacred space. It might have been a bit too complicated for its own good - too many characters that didn't really add anything to the core story about lonely people with tragic pasts finding love and forgiveness in each other. Another editor asleep at the wheel. That seemed to be happening a lot in books coming out this millennium. Maybe editors get paid better for AV. At first I found the back stories a bit labored but I forgave the writer with the benefit of hindsight. On first reading there seemed to be a disconnect between the children and the adults they grow up to be. A bit superficial. Maybe a better writer could have joined the dots of character in the "Transcendence" scenes. A reasonable attempt was made here , but some certainly worked better than others. I was a bit let down by the AI ending - but it would have taken a genius to write the ending I really wanted to read. Just realized I never marked this as "read" - I must've read it half a dozen times during the final revision process, and once since! I bought this after attending McKitterick's reading sometime in 2010 November. I'm really looking forward to it. I stopped reading it after the first 50 or so pages, and a global war between two rival megacorps which have divided Earth between themselves. I tried to grit my teeth and accept a Solar System divided between giant rival megacorporations, but it turned out that the war is fought just like the 2nd World War, only with accelerator rifles instead of gunpowder ones. Meh. Wow. This is one of those stories that you can’t stop thinking about Long after you have finished reading it. There is so much to digest, it makes you wonder how the author could get so much into one book. Well, I finished it. Not the worst book I've ever read but I can't say I'll be recommending it to anyone else, hard to put a finger on why it didn't work to me, perhaps too many characters and none of them in enough detail. I am an engineer and a scifi genre fan. This book just did not do it for me. I cannot put my finger on it exactly but I was bored and uninterested in the characters. The book started out with promise but about half way through, I gave up because I just did not care anymore. I actually abandoned the book about a hundred pages from the start. It just wasn't good enough to warrant my sustained attention, I guess. Christopher McKitterick's short work has appeared in Analog, Artemis, Captain Proton, Extrapolation, Foundation, Mission: Tomorrow, Mythic Circle, Ruins: Extraterrestrial, Sentinels: In Honor of Arthur C. Clarke, Synergy SF, Tomorrow SF, Visual Journeys, Westward Weird, World Literature Today, and elsewhere. He teaches science fiction and writing at the University of Kansas, where he is Director o Christopher McKitterick's short work has appeared in Analog, Artemis, Captain Proton, Extrapolation, Foundation, Mission: Tomorrow, Mythic Circle, Ruins: Extraterrestrial, Sentinels: In Honor of Arthur C. Clarke, Synergy SF, Tomorrow SF, Visual Journeys, Westward Weird, World Literature Today, and elsewhere. He teaches science fiction and writing at the University of Kansas, where he is Director of the Gunn Center for the Study of Science Fiction. Chris' debut novel, Transcendence, was published by Hadley Rille Books. He recently completed his newest novel, Book 1 of The Galactic Adventures of Jack & Stella, and is revising a far-future novel, Empire Ship. Want to see what else Chris is up to? Get in touch on Facebook, Tumblr, and Twitter.